Supporters of fascist and English Defence League founder Tommy Robinson, have said they will march in London on Saturday 9 June. Robinson and his supporters have a history of racism and Islamophobia, and have many links to fascist organisations. Anti-fascists have issued a national call for a counter demonstration which will gather at 2pm in Whitehall. Far-right supporters have reacted furiously to Robinson’s imprisonment for contempt of court. In Whitehall a week ago several hundred from various far-right splinter groups and the UK Independence Party (UKIP) held an intimidating demonstration. Journalists were threatened by drunken Robinson supporters. Last Friday some 400 of his supporters marched through Leeds chanting anti-Muslim slogans. In Wales, swastikas appeared on a university campus in Newport, sprayed next to ‘Free Tommy’ graffiti. 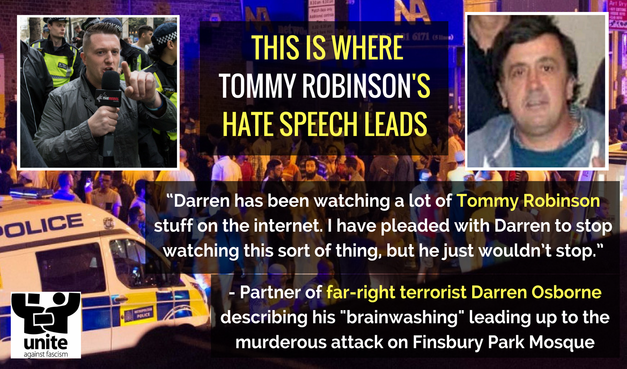 Robinson and the far right are receiving support from racist politicians across Europe. The Islamophobic Dutch politican Geert Wilders has said he will join the protest in defence of Robinson in London. Wilders claims that “Islam and freedom are not compatible”. His Party for Freedom (PVV) leader campaigns to ban the Quran, close Dutch mosques and end immigration from predominantly Muslim countries. Robinson, 35, whose real name is Stephen Yaxley-Lennon, was imprisoned for 13 months after broadcasting on Facebook outside Leeds Crown Court. The sentence consisted of 10 months for contempt of court and a further three months for beaching the terms of a previous suspended prison sentence. He pleaded guilty to the offences. The judge said the footage he streamed was seen by more than 250,000 people and could have prejudiced a long-running trial, causing it to collapse at the cost of “hundreds of thousands of pounds” of taxpayers’ money. Details of the case about which he was broadcasting cannot be reported until later this year. What those calling for free speech for Tommy Robinson fail to understand, perhaps deliberately, is that his imprisonment has nothing to do with free speech or racism, but is the consequence of his lack of respect for British justice: the principle that everyone who is charged with a crime deserves a fair trial. Robinson, as leader of the racist EDL, led gangs of thugs around the UK on violent protests aimed at intimidating Muslims. Long campaigns by organisations such as Unite Against Fascism (UAF) eventually resulted in Robinson quitting the EDL in 2013. Recently Robinson has been whipping up tension around the topic of ‘free speech’. He uses his platform to attack Muslims and stir up racial hatred – calling for ‘militias’ to ‘sort out’ Islam in Britain. His supporters want to exploit his imprisonment to spread more racism. Robinson has become an increasingly popular figure at recent Football Lads Alliance (FLA) and ‘Democratic’ FLA events and was at the centre of a thousands strong far-right ‘free speech’ rally in central London on 6 May. Wilders’s move points to the way the far right in Britain are organising. They have growing international links with far-right figures across Europe and Breitbart and the Alt-right in America. UKIP is increasingly throwing in its lot with the attempt to build a street army. This strategy mirrors the position elsewhere in Europe, though as was seen in Berlin recently, there is inspiring resistance to the far right. There are many internal tensions, such as the FLA/DFLA split. Anti-racists have made a difference in undercutting some of the support the FLA/DFLA have. What’s left of the EDL in Newcastle and York have also called ‘Free Robinson’ demonstrations on 9 June, to which anti-fascists in Newcastle and York are responding. 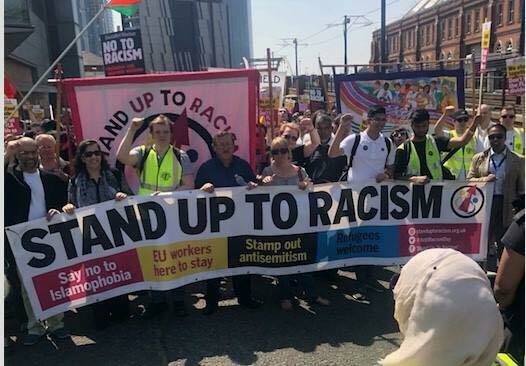 This is the time to re-energise and mobilise support against the far right in the UK. London on 9 June is a test. The far right are looking to achieve a sizeable presence. All those who oppose the far right must unite and (if not going to Newcastle or York) be in central London on 9 June.